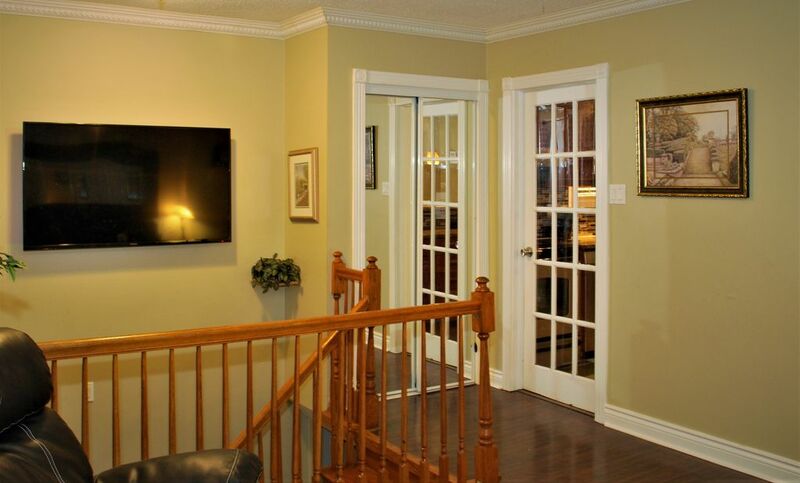 Enjoy this spacious beautiful semi-detached home which accommodates up to 9 guests. Britannia beach, Parliament Hill, National Art Museum, National Art Center, War Museum, Bayshore Shopping Center, Canadian Tire Arena, and TD Place Stadium. Stove, Oven, dishwasher, cook top(basement), microwave(2), two door refrigerator with water dispenser, extra refrigerator in basement, coffee maker, pots, pans, kettle, glasses, mugs, punch bowl set, plate sets, utensils, cutlery, kids dinnerware, , cutting board, dishwasher, toaster(2) and some spices. One kitchen is on the main floor, and another smaller one in the basement. We definitely would stay at this home is Ottawa again. We had six (6) adults and we had all the comforts of home. Anita was quick to reply to my emails. We went to the Canadian Tire Centre to watch a hockey game. We took a cab (5 minutes from house and $7.00) to Buster's Bar and Grill at 2525 Carling Avenue. The food is great and the staff is very friendly. We were able to purchase a $5.00 ticket for a bus ride to the hockey game from the bar. We enjoyed drinking and having fun. The bus ride was a hoot. We would definitely stay here again and would highly recommend this house. The house is a great place to stay if you want to visit Ottawa. Just a short ride away from downtown, the house is clean, modern and very well stocked. It has plenty of room for lots of people. We would definitely stay there again if we make another attempt to skate the Rideau Canal. Lovely home, very clean and lots of room for all 6 of us. We were in Ottawa for a hockey tournament. The house was centrally located, so easy access to all the arenas in Ottawa. The house was clean and bright. The beds were comfortable and it was quite at night. The owner was easy to deal with and very kind. We would definitely stay here again if we are in Ottawa. The place was clean and well maintained. Furnishings and amenities were very good. There was plenty of room for the 6 of us. It is located near busy streets but noise was not an issue inside the house. There is parking for 2-3 cars on the property off to the side of the driveway, which requires a bit of maneuvering, especially to get out on the road. There is easy access to the 417 making it easy to get to downtown Ottawa. Lots of shopping nearby. Anita was very quick to respond, easy to deal with and dealt with a few minor issues promptly. The only thing we found "unwelcoming" was the prominence of warning signs, particularly the one re: smoking inside. I'd suggest the owners try to find a better way to get that message across. We enjoyed our stay there very much and definitely recommend Anita's place. It was an excellent choice for our family of 6. For our visit, the home's location was ideal - 15 minutes to downtown, 15 minutes to Canadian Tire Center (Kanata). Great spot for a “base camp” from which to set out for a day’s activity in the nation’s capital. It is also close to restaurants and shopping. The rooms provide enough space to accommodate our needs, and the provided amenities were enough to supplement for those things that we forgot to pack. Parking and exiting can be a bit of a challenge (especially if there is more than one vehicle – our case, since the other couple was arriving from Quebec). Generally, the furnishings are practical, but not luxurious. I would recommend upgrades to beds in the two rooms that we used, though. The older mattresses have a plastic protective covering and without fitted sheets nor a heavy quilt, it can make for a difficult night’s sleep. Overall, we were pleased with our stay. We reserved the house for 8 and it was spacious enough for us all. The owner left plenty of towels and toiletries, the kitchen was fully equipped with plates cups utensils and appliances. The location is very convenient though we had cars too. The only issue for this light sleeper was that I could hear the traffic on the road behind the rooms. I got some ear plugs and slept well after that. I would certainly rent this place again. It was a home away from home.